In the Gibson Assembly® Cloning Guide and our last blog post, we introduced a variation of the Gibson Assembly® method that does not rely on the use of homologous overlapping ends for fragment assembly. This technique, Gibson Assembly® PBnJ™ Cloning, has many potential applications. Here, we’d like to focus on two of these, adding DNA overhangs and insertions. To create a 3’ overhang, simply design a primer containing the intended overhang sequence. To protect the primer from chew-back during the assembly process, include four phosphorothioate modifications at the 3’ end of the primer. Creation of a fragment with the 3’ overhang is initiated by combining the single phosphorothioate-modified primer, your corresponding DNA fragment-of-interest, and Gibson Assembly® Ultra Master Mix A. The Gibson Assembly® Ultra procedure yields a DNA fragment containing a 3’ overhang, as shown in the following illustration. Insertions can be added during cloning using another variation of this technique. Mutagenesis, promoter or enhancer functional analysis, and large-scale genome modification studies, or even simply adding a short sequence of interest (i.e. gRNA target sequence, barcode, restriction sites, etc.) are all potential applications of Gibson Assembly® PBnJ™ Sequence Insertion Cloning. Gibson Assembly® PBnJ™ Sequence Insertion Cloning adds sequence between adjoining fragments during assembly. As shown below, appropriately designed primers are critical to the outcome of the assembly reaction. One primer is designed to contain homology to one of the fragments, and another primer is designed with homology to the other fragment. The insertion sequence must be added to the 3’ end of both primers and is necessary to bridge the fragments to be joined since this is the only region containing homology between the fragments. Both primers are synthesized with at least four phosphorothioate bonds at the 3’ termini to protect them from chew-back during the assembly reaction. The assembly reaction is initiated by combining DNA fragments, appropriate phosphorothioate-modified primers, and Gibson Assembly® Ultra Master Mix A. Following 3’ chew-back mediated by Master Mix A, the reaction undergoes heat inactivation and denaturation, which allows for the annealing of the bridge/insertion region of the primers. Strand extension is then mediated by Ultra Master Mix B resulting in seamless assembly of fragments with an insertion. 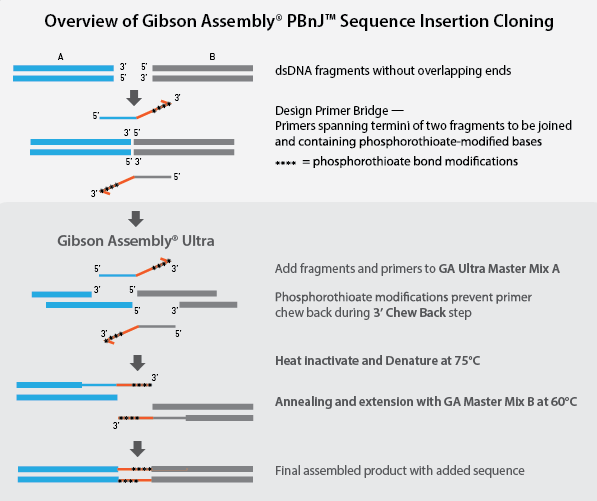 Learn more about Gibson Assembly® products at www.sgidna.com/reagents or email us at info@sgidna.com for assistance with Gibson Assembly® PBnJ™ Cloning. 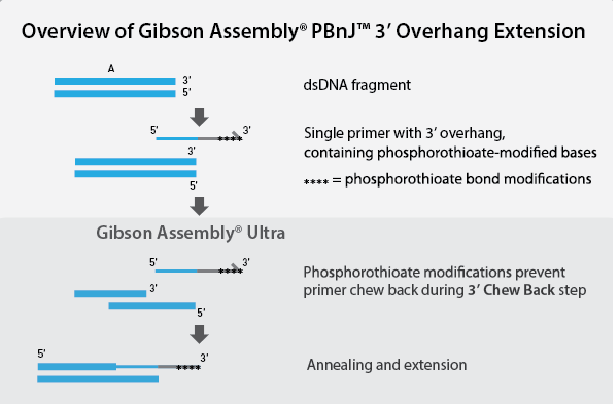 Read the full Gibson Assembly® PBnJ™ Cloning Series. Ideally, How Much DNA Should Be Used For Gibson Assembly® Cloning? How Does Gibson Assembly® Cloning Compare to Traditional Cloning Methods? Efficient, high fidelity cloning in one simple step. 2014 © SGI-DNA. ALL Rights Reserved.. Simple theme. Powered by Blogger.